Silicon Slopes, UT – October 3, 2018 – Domo, Inc. (Nasdaq: DOMO), provider of the leading cloud-based operating system for business, today announced it is now live with Amazon Web Services (AWS) in Japan, as it expands to meet the growing needs of customers and partners in the country, as well as global customers with worldwide operations. 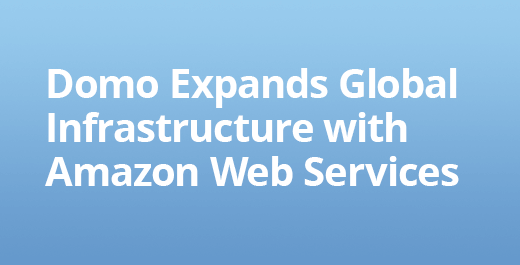 This announcement highlights Domo’s continued growth and footprint, following previously announced AWS expansions in the Europe, Middle East and Africa (EMEA) and Asia Pacific regions. This AWS expansion in Japan is designed to aid Domo customers who require regional support and data governance, and further establishes Domo’s commitment to its more than 1,600 worldwide customers that trust Domo to support and secure their most valuable data. For more information on the Domo platform, visit https://www.domo.com/product.